WordPress comes with a user friendly post editor called the Visual Editor. 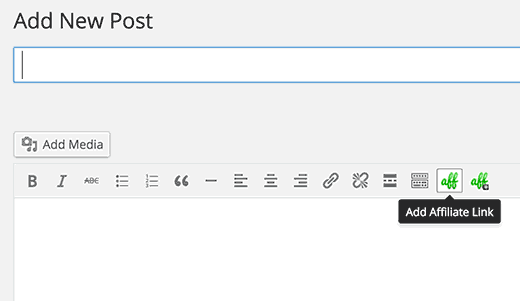 You can see the visual editor by going to Posts » Add New or by editing an existing post or page. To create a link, you need to click on the Link button in the visual editor. When you click on the insert link button, it will bring up a popup window. In the URL field, you will enter the actual hyperlink, and in the link text field you will add the text that will be linked. You also have the option to check the box next to ‘Open link in a new tab’ option. This will open the link in a new browser tab. It’s recommended that you use this option if you are linking to an external site. Simply click on ‘Or link to existing content’ option and WordPress will show you recent content and a search field. You can search for a post or scroll down to find it from the list. You need to click on the post title to select it and then click on Add or Update Link button. Take a look at our 14 tips for mastering the WordPress visual editor to learn more. WordPress allows you to add Widgets to your site’s sidebar or other widget ready areas. Most of these widgets are automated and do not have many options. For example, the recent posts widget will automatically show links to your recent posts. If you want to add some custom text with links in your sidebar, then you can use the Text Widget. 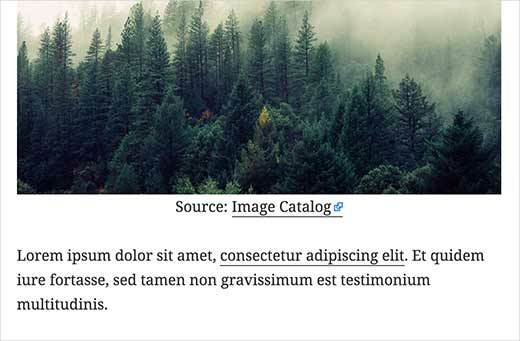 Text widget allows you to add text and basic HTML inside it. There are two ways you can add a link into a text widget. First method requires you to write some very basic HTML. Creating a link in HTML is very simple. Take a look at the following example. It will now show WPBeginner linked to wpbeginner.com. The href tag is where you add the URL. Make sure to add http:// before the domain. In between the anchor tags, you can add any text that you want to link, in our example WPBeginner. Here is a screenshot of a text widget with an HTML link inside it. If you don’t want to write HTML, then you can enable visual editor for your text widgets. You would need to install and activate the Black Studio TinyMCE Widget plugin. If you need help installing a WordPress plugin, then follow our step by step guide to install a WordPress plugin. Upon activation, simply go to Appearance » Widgets page. You will notice a new widget titled ‘Visual Editor’ under available widgets. Drag and drop this widget to a sidebar where you want to add your custom text and links. The widget will expand to show a text area with the same Visual Editor as your WordPress posts and pages. You can now add links and format your text just like you would do in the post editor. Do you want to add links in your site’s navigation menu? WordPress comes with an intuitive menu editor which allows you to create and manage navigation menus on your WordPress site. Simply go to Appearance » Menus page. If you don’t have a navigation menu setup, then you can create one by entering a menu name. If you already have navigation menus set up, then you can add, edit, or delete links from it. 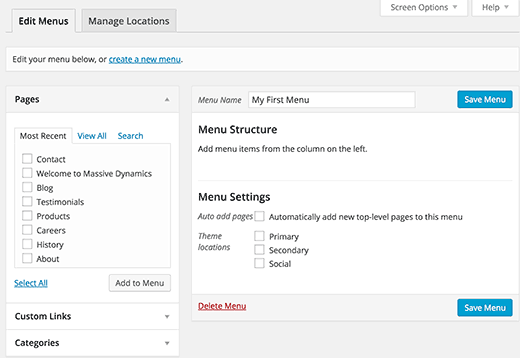 Take a look at our beginner’s guide on how to add navigation menus in WordPress. Many experts recommend adding a nofollow tag with links pointing to external websites. It improves your SEO score and protects your site’s link juice. 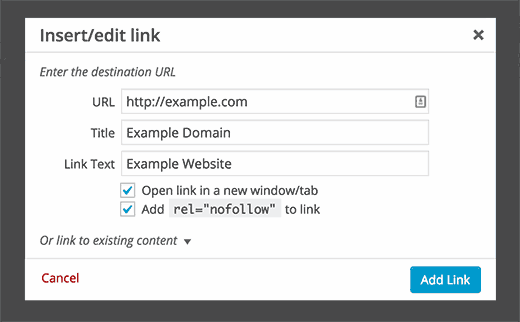 Here is how you can add title and nofollow options to insert link popup in WordPress. Simply install and activate the Title and Nofollow for Links plugin. Upon activation, the plugin will add title and nofollow options to insert link popup. Take a look at our guide on how to add title and nofollow to insert link popup in WordPress for more information. Want to add a button to your WordPress posts or pages? There are many ways you can do this. You can write your own HTML and CSS for your buttons, or you can try a plugin. The problem with most plugins is that they want you to use shortcodes to add buttons and links. Adding different parameters to a shortcode is very much like writing HTML. Simply install and activate Forget About Shortcode Buttons plugin. Upon activation, create a new post or edit an existing one. You will notice a new button in the visual editor menu to insert buttons into your post or page. Clicking on the button will bring up a popup where you can customize your button, choose colors, borders, add text, and links while seeing a live preview. For more information and details take a look at our guide on how to add buttons in WordPress without using shortcodes. Have you noticed how Twitter and Facebook automatically display thumbnail images for the links you share? You can make your WordPress site do the same. 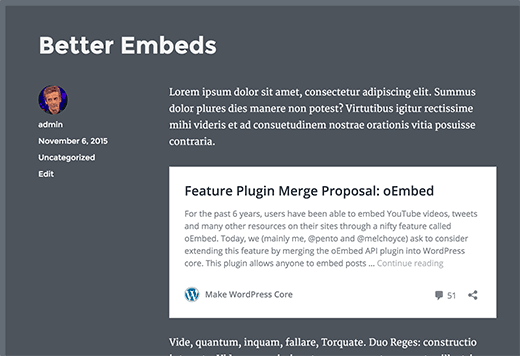 WordPress can automatically embed links as content cards for other WordPress powered sites. This functionality was added in WordPress 4.4. Simply paste a link in the post editor and if the URL is from a WordPress site, then WordPress will automatically embed it. But if you don’t like WordPress’s implementation of content cards, then you can try Content Cards plugin. It allows you to whitelist this feature for select few sites, and it uses the Facebook open graph meta data, so it will work on non-WordPress sites as well. See our tutorial on how to add links as content cards in WordPress for details. Do you want to increase your site’s revenue by using affiliate links? Affiliate marketing provides a steady income to many blogs and websites. All you need to do is add your referral links to products and services that you recommend, and when your visitors purchase these products, you get a commission. The problem that most beginners face is that each product or website they want to recommend has a different URL. Keeping track of all these URLs is not possible specially if you are recommending multiple products. The best way to add and manage affiliate links is by using an affiliate management plugin. Simply install and activate ThirstyAffiliates plugin. 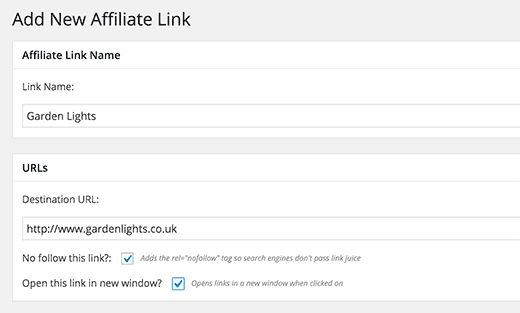 Upon activation the plugin will add a new menu item labeled Affiliate Links in your WordPress admin menu. Click on it to add your affiliate links. Once you are done, you will be able to easily insert affiliate links into your posts and pages by clicking on the add affiliate link button. For detailed instructions take a look at our guide on how to add affiliate links in WordPress with ThirstyAffiliates. You may also want to read this article about: Top affiliate marketing mistake you need to avoid. Many sites like Wikipedia, adds an icon next to links for external websites. The purpose of this icon is to tell users that clicking on the link will take them to a third-party website. Here is how you can do an external link icon on your WordPress site. First, install and activate the External Links plugin. Upon activation, simply go to Settings » External Links page to configure plugin settings. You need to check the box next to ‘Mark outbound links with an icon’ and save your settings. You can now visit your website, and you will see an icon next to all external links on your website. For detailed instructions, take a look at our guide on how to add an external link icon on your WordPress site. 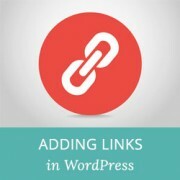 That’s all, we hope this article helped you learn how to add a link in WordPress. You may also want to see our guide on how to fix most common image issues in WordPress. Your tutorials are very nice and very interesting.I love them. I have links at the bottom of my webpage and the list is getting a bit long. Is there any way to make them appear in two columns rather than a single long column? It would depend on how you’re adding the links and your specific theme. If you reach out to your theme’s support there may be a design for your theme for two widgets in the footer rather than one if that’s how you’re adding the links. I can’t seem to find a way to make links a specific color. I had heard you should select Theme Options from the Appearance category in the Dashboard, but there is no Theme Option. I also cannot find it in the Custom area. Where is it? thank you. I am currently working in WordPress, and I cannot find the link button on the menu in the dashboard. Please tell me has the ink button been taken out of the WordPress dashboard menu. There is no link button on the 4.9.8 version of my WordPress. The link manager feature was removed from WordPress long ago (in 2012). 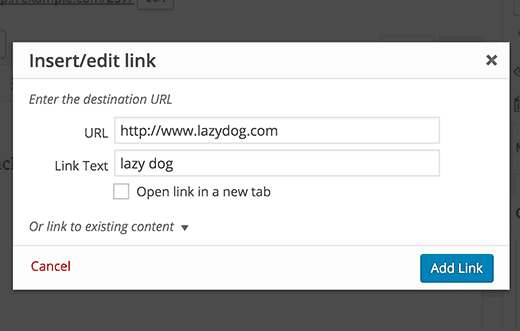 You can still add the functionality back by using the Links manager plugin. This was so helpful and clear! Thank you! Hi is it possible if I have a link to add it to a blog post or page as the actual page and not the link? So instead of a signup page as usual. When they open the page it goes directly to the sales page? How to link a category to page url ??? Directions for simple link to blog seems to be outdated. Have used for years, but current option does not show “add link” just a list of former blogs. What happened? Yes, you are right. We will be updating this article soon. Meanwhile you can still find the insert link button in the post editor. You can also use CTRL+K (Command+K on Mac) to insert link address. What is the correct method of internal link? domain/post name OR just /post name? I have used /post name and that is working fine on site, but yoast not identifying as internal link. Kindly advise. You should use the complete URL of your article. Thanks for the quick reply. I learned a lot and still reading blogs of wpbeginner and shoutmeloud. Wp begginer is the best way to learn WordPress thank allow, I have fined exactly post am looking for. I have a website when I first got it about 3 months ago everything was fine. Now all of a sudden I can’t make any new post or pages. Also I can’t update anything in website configuration settings. I get a message something like wp-admin php index page not found or this page contains a unknown code. Any feedback on this problem will be greatly appreciated. I also can’t hyper link anything. Even if I could it wouldn’t do any good because I can’t publish anything. Can someone please help me I will recommend you on my website. Thanks! Please take a look at our WordPress troubleshooting guide. It will help you figure out what’s causing these issues and how to fix them. HELP!!! I am not a coder, and blogging just for pleasure, but I cannot get a link to work. I had my theme professionally installed and have not messed with the code any. The url works but the link text does not show up. I am left with blank spaces in my writing. If you know that something is there you can click on it, and it will re-direct you appropriately, but I do not know how to address the text not appearing. Any advice? In edit mode it looks fine, but if you view it live you can see the blank spot. It seems like the color settings for links in your theme are set to use white color for link text. You can check your theme’s settings by visiting Appearance » Customize and look for colors section. There you need to look for links color option it would be set to white. You will need to choose a darker color and then save and publish your changes. If you cannot find the colors option in your theme settings, then you can go to Appearance » Customize and then click on the ‘Additional CSS’ tab. See our article on how to add custom CSS in WordPress for more detailed instructions. Since the last WP update, I am no longer able to add links. Any ideas on how to fix this? I would like to add a link in the Primary Navigation that will jump down to a certain part of the homepage. Is that possible? I want to add an internal link to a home page description. See our guide on how to add a link in WordPress to learn how to add links in different areas of your WordPress site. I am the senior writer for Biff Bam Pop. com and also have my own wordpress blog gilbert speaks and on both sites, the link button will not work for me. This problem began a month ago and nothing I or the administrator for BBP have done has worked. I do reviews of television and film and also interviews for Biff Bam Pop and not having a link button is very stressful. Would you be willing to walk me through this frustrating matter over the phone? I am still having problems adding links. I am now getting some links happening but not others even within the same post? What is going on? It can’t be any plugin issue because some links work and others wont. I’m following the same process! Help. Feeling VERY frustrated! I am having the same problem as Tara above. Only I can link some and when I look on the preview some of the links will be highlighted but not all. I am doing it the same exact way for all the links. What is causing this? It seems I’m having a similar problem to you Vickie. Have you had any luck fixing it? I have tried to insert a link and it all seems to work until I update the blog post. It just appears as normal text in the post and is not a link! Any suggestions? I’ve done it before in other posts and have not added any new plug ins. I am trying to add a link to amazon associates page in a post. when I click on link it takes me to a blank page site. But in the widgets it works and takes me to the amazon product. Am I missing something. Any ideas how to resolve that? You need to click on the text that says ‘Or link to existing content’, it will expand the Insert Link popup and will show a search field. Type something from the post/page title that you want to link to and it will start showing it in the result. Please see the Gif animation in the article. If you do not see the ‘Or link to existing content’ text or your it does not work, then this could mean that a plugin or your theme is causing conflict. Try after disabling all your WordPress plugins temporarily. If it works, then enable plugins one by one and retest until you find the one causing the conflict. So, I’ve successfully entered a hyperlink using the “Insert/Edit Link” button, but when I preview my blog page, the link does not show up (it’s a blank white space) until I hover my mouse of the space and then it shows up red. How can I get the link to display without hovering my mouse over the link? 1. Deactivate all your WordPress plugins and then see if the link color returns back to normal. If it does, then activate plugins one by one until you find the culprit. 2. If it is not a plugin, then it could be a change you made to your theme. You can try installing a fresh copy of your WordPress theme but we will warn you that if you made any changes to theme code, then you will lose them. 3. Your theme may be using a dark color as background which you changed to a lighter background? Best beginner’s tutorial on WordPress. Thank you! All other ”tutorials” read like physics lectures. I get your WordPress weekly tips. I was able to fix a web link with your widget instructions. I really like the Forget Short Code Plugin. I was able to add in new boxes, etc. to enhance my site. My blog is a free blog. I promote books so I have pages for each book. How do I include an image with every tweet that is sent. Every one would have to be different for each page. I don’t know what you call this so I don’t know what to search for. I have noticed there is an image, sometimes, but not always. Please take a look at our guide how to add Twitter cards in WordPress. I don’t know how I made this mistake, but….after I put in link (between 2 pages) when I click on either one I get “WordPress cannot find this page”. If I erase and start over here, I get the same one. What did I do the is incorrect? website: ; jake361denis. category: A Thing Compendium. Post: Dromedary Dreams. I have already learnt alto about compress in less than a month. Am satisfied I subscribed to wpbeginner.com. Keep up educating the world. Thanks for the tips. I have a question about the amount of plugins that are appropriate. I’ve heard that too many plugins (as in more than 15) slows down a page and is unnecessary. What are your thoughts? I think it’s a very illustrative and very useful guidelines!